Preheat the grill over medium-high heat. Brush the flank steak with olive oil and season with salt and pepper. Grill the meat for 5 to 6 minutes per side for medium (about 145 degrees Fahrenheit on a meat thermometer). Let rest for 5-10 minutes, then thinly slice against the grain and set aside. Bring salted water to a boil in a medium saucepan. Cook the carrots for about 3 to 4 minutes until tender, remove with a spider or slotted spoon and place in a bowl. Repeat with the potatoes and green beans, adding them to the same bowl with the carrots. Lastly, cook the peas for just one minute, then drain and place in the bowl with the other cooked vegetables. In a bowl, whisk the vinegar with the oils, salt, pepper, sugar and garlic, until emulsified. Add the onion and let macerate for at least 15 minutes. You may cover and place in the fridge for up to a couple weeks. Shake before using. If you like your salad very juicy and dressed, double the vinaigrette! Dress the lettuce with some of the vinaigrette and place on an extended platter. Pour some of the vinaigrette on to the cooked vegetables, incorporate the radishes and cilantro, mix well and place on lettuce. Place the sliced meat on top, add the avocado, dress with more of the vinaigrette. Add some of the pickled jalapeños and chipotles in adobo on the sides of the plate or to your liking. Serve with warm corn tortillas on the side. I made this and it was a five star restaurant meal. My family kept raving about it and could not stop eating. Awesome! I’m so happy everyone loved it, Henrietta. I am watching you here on PBS all day today (May 5). Your boys are growing into such handsome young men. Saw you make the Salpicon and can’t wait to make it for my 17 year old grandson who won’t let a vegetable pass his lips. I think this might be the way! Thank you…it looks so good! I would love to to a cooking class with you and absorb some of that knowledge. Do you do cooking tours, culinary excursions, or cooking courses? Oh yes, I do cooking classes in Washington, DC at the Mexican Cultural Institute: https://patijinich.com/category/upcoming/ I hope to see you there one day…and that your grandson enjoys the recipe! Mire tu programa en PBS el Sábado pasado y decidí tratar de hacerlo para la cena de anoche. El plato está increíble, mi esposa e hija se sirvieron doble porque no podían dejar de comer. Todo esta muy balanceado y el sabor ni hablar. Satisfaccion al 100%. Muchas gracias estubo super!!! I made this for dinner tonight for my husband and me, and cut the recipe in half. He charcoal grilled the steak and I did the rest. I think it serves way more than 6, though, as we could only eat half of our serving, with a lot left over. Delicious! My husband thinks it would be better chilled, though, but then I have to get used to the cold potatoes. However they make it filling, especially when rolled in a tortilla! It could easily be a vegetarian dish, too. So glad you and your husband enjoyed it, Gina! Healthy, yummy——. Picky kids? Parents need tequila!!!!!!! This was our Christmas meal! Along with tamales of course. But the Salpicón was a huge hit. Muchísimas gracias! Feliz Navidad y un bendito Año Nuevo. Yay! Happy holidays and have a wonderful 2018 Dolores! Cannot wait to make this salad for my girlfriends –Looks so delish!! What is the cocktail you served with it?? Looking for that recipe too!! Thanks Pati! My mom and I love your show. I would love to meet you and learn your cooking. 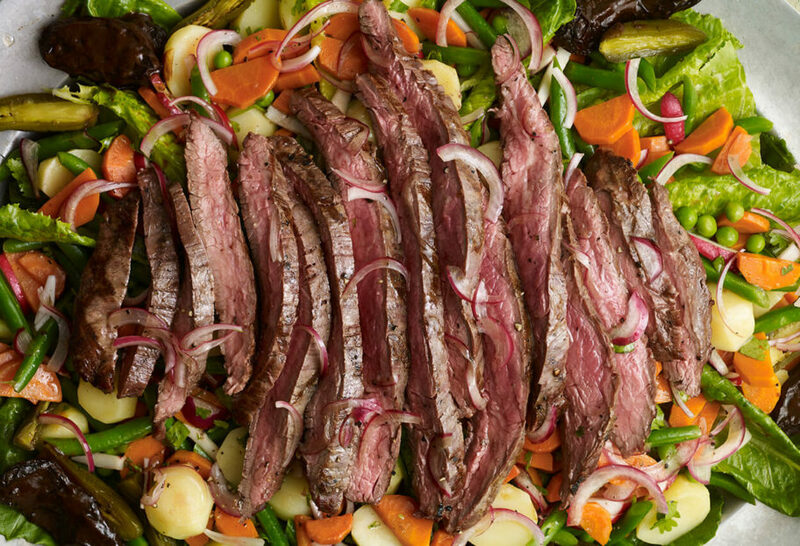 This is the healthiest most delicious steak salad I’ve ever prepared. Gracias! Love watching your show and tried many recipes. This salad is my new best go to dinner for the week. It not only looks appetizing but tastes great. All vegetables work well together. I doubled the vinegrette dressing for a day and skimmed off an inch of oil on top. It worked well and was less oily. Its been in fridge for over a week and it just gets better tasting. Im waiting for my brother Aaron to try it as he saw this episode, and little did he know I had made the vinegrette ahead of time and once he tasted it, he raved about it. Cant wait to make it for my friends! I sure can count on this recipe as a crowd pleaser! Thanks Pati….your show is fun to watch. Thank you for sharing, Robin! I’m so happy to hear that it is a crowd pleaser! This was sooooooo delicious! Even my kids had seconds. Thanks for the recipe! This is so fresh, tasty AND healthy – my favorite kind of food! I’m making this dish for my woman friend tomorrow night and it will be fun! Thank you!!!! our family appreciates this recipe, it was wonderful, easy, delicious and a definite keeper. We could not stop eating Hit another homerun! thank you.